Bottle gourd is a very common and favorite vegetable in this subcontinent. It is known as a cool vegetable. Its specialty is that you can eat every part of bottle gourd. You can cook bottle gourd’s skin, bottle gourd fruit, and bottle gourd’s leaf. If you want, you can cook bottle gourd’s baby seed also. Even when the bottle gourd ripe then you can use its skin for making a musical instrument, which name is “dugdugi”. 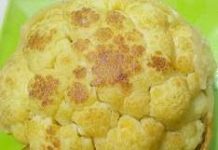 We can cook many ways of bottle gourd. In a lot of items, the bottle gourd curry recipes with the prawn are one of them. 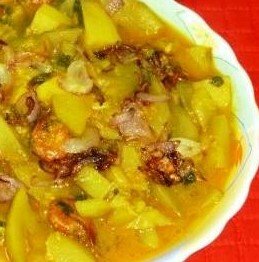 Bottle Gourd Curry recipes with Prawn is a very popular fruit vegetable, commonly known as “Lau curry” in Bangladesh. There are some folk songs about this curry explaining its deliciousness. It is available in most part of India, Bangladesh, Nepal and some part of China. The curry matches well with plain rice, naan-roti, and chapatti or tortilla. Cooking of Bottle Gourd Curry is so easy that those new adventurers can start with this type of menu. It is even tasty without mixing any other item, except few common spices. However, to add extra taste prawn or other small fishes may be added to it. Remove the skin of the bottle gourd and cut into 2”X ½” slices. Use a sharp knife for cutting. You can check local market or Amazon for the best quality knife. This a very important tools for our regular kitchen life. Remove the skin from the potatoes (if the potato is new then you can keep the skin) and cut into the same size of bottle gourd’s pieces. Heat oil in a nonstick cooking pan. Fry cleaned prawns on cooking oil and add one pinch turmeric powder and salt. Take out the prawns when half fried. Keep aside. Add slices of onion to oil and fry until the color is brown. Take out some bit of beresta (fried onion, brown color). Add garlic paste, cumin powder, coriander powder into the remaining hot oil in the pan. After 1 min put one-cup water in the mixture of boiled spices. Usually, when the bottle gourd is a baby then I never use extra water for cooking bottle gourd. Because bottle gourd has own water. When the spicy water is bloomed, put all bottle gourd and potato slices and cover with a lid. After 5 minutes stir and add prawns, green chili and again cover for another 5 min. Add coriander leaves after 4 minutes. After the cooking is over, take the curry in a dish and put some bit of beresta on top. Try to cook on induction cooktop. This is very safe for cooking. Bottle gourd curry is ready and serve it with white rice, nan-roti, or chapatti. 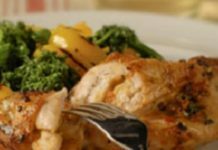 This recipe is healthy and easy to cook. If you like my bottle gourd curry recipes with prawn please share this recipe with your family and friends. I love to cook and like share my delicious food recipes with my beloved friends.